How to pressure Israel to negotiate a two-state solution: The Obama administration has several options at the United Nations. The United States has relied on carrots for too long. It’s time for sticks. 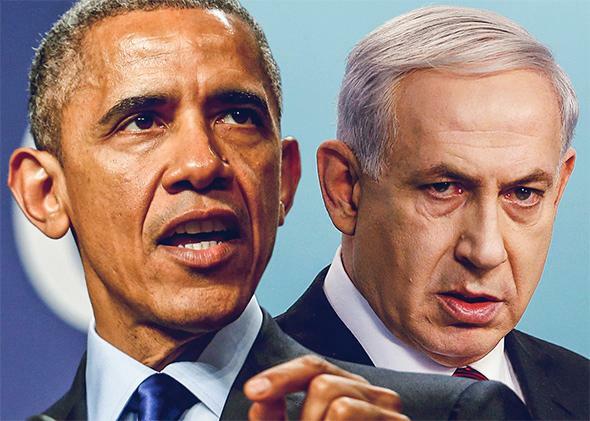 Reacting angrily to the prospect of U.S. pressure on Israeli President Netanyahu, President Obama’s critics have contended that he treats Israel worse than he treats Iran. Photo illustration by Slate. Photos by Reuters. In the wake of Israeli Prime Minister Benjamin Netanyahu’s declaration that a Palestinian state would not be created on his watch, the Obama administration has signaled that it is considering a “reassessment” of its options with regard to the two-state solution. In a Sunday interview with Israeli radio, U.S. Ambassador to Israel Dan Shapiro confirmed that a shift is under way. While Shapiro was careful to make clear that no decision had been reached regarding future U.S. action, he did point out that Washington’s defense of Israel at the United Nations was predicated on Jerusalem’s commitment to the two-state solution. For years, Netanyahu has strung the United States and the international community along with a kind of “Two-State Hamlet” act, providing just enough reasons, little hints here, a trail of breadcrumbs there, to sustain the hope that yes, under the correct circumstances, and offered the appropriate truckload of carrots, he could be the Man to Make a Deal. But, as Netanyahu himself once said, “The question is not of hope, the question is of actual results.” And the results are now in on Netanyahu. The United States and its allies remain convinced that the only way to resolve the Israeli-Palestinian conflict is through direct negotiations. Indeed, even the Palestinian leadership, while they may see international efforts at the United Nations and the International Criminal Court as useful in creating leverage against Israel, understands that the only way a two state-solution ultimately gets done is by Israelis and Palestinians sitting around a table and signing a bilateral agreement between their two states, Israel and Palestine. But the administration is signaling that, at least under Netanyahu, the bilateral path is now shut. Which means it’s time to look at other options for advancing toward the two-state goal, such as diplomatic pressure at the United Nations. When Netanyahu spoke of the need for results, not hope, he was referring to the need for pressure on Iran. Indeed, Netanyahu has been the loudest advocate of pressure on Iran to change its policies and engage seriously in talks about its nuclear program. And the very same logic now applies to Netanyahu and a two-state solution, particularly with regard to the ongoing construction and growth of illegal Israeli settlements on occupied territory in the West Bank and Jerusalem, which many believe will eventually make such a solution impossible. While there are obvious differences between the Iranian nuclear program and the Israeli settlement enterprise, there are some remarkable similarities. Both are couched in broad nationalistic terms. Both are based in a highly tendentious interpretation of treaty commitments (though, to be fair, Iran’s assertion of its right to enrich uranium under the Non-Proliferation Treaty is a bit more plausible than Israel’s assertion that the Fourth Geneva Convention does not prohibit the transfer of its population into occupied territory). Both involve the creation of “facts on the ground”—just continue to build and expand and eventually the world will have to accept it. Obviously the idea that Obama is nicer to Iran than Israel is ridiculous on its face. Iran is under the most comprehensive sanctions regime in the world, which the Obama administration has led in constructing. Israel, on the other hand, has continued to enjoy billions of dollars in U.S. aid, and protection from any international legal consequences for breaking the law and building new settlements. Indeed, it’s precisely because U.S. support has been so unconditional that successive Israeli governments have seen no reason to change their provocative policies, and Israeli voters have seen no reason to seriously challenge their governments to do so. At long last, it seems that this equation is about to change. One particularly interesting part of McDonough’s remarks on Monday was something he didn’t say. While he stressed past U.S. support for Israel at the United Nations, he did not include a rejection of Palestinian efforts to advance their goals at the world body, as similar statements from administration officials have done in the past. This isn’t to suggest that the United States will suddenly throw its support behind Palestinian U.N. initiatives, but there are a number of other options for applying pressure on Israel. They could include crafting a U.N. Security Council resolution laying out clear terms of reference for future negotiations, something the Palestinians have long sought, and which Obama himself articulated, to Netanyahu’s dismay, in his May 2011 speech at the State Department. The United States could go further, setting out a specific set of parameters laying out the official U.S. view of a final disposition of the key final status issues—borders, security, refugees, and Jerusalem. The United States could simply choose to abstain from a new U.N. Security Council resolution declaring Israeli settlements illegal (which remains the official position of the U.S. government, though “illegitimate” has been the term used since the 1980s) rather than vetoing, as it did in February 2011. While a settlements resolution might seem less drastic at first glance than one laying out a broader set of parameters, it could actually be a more potent tool of pressure on the Israelis. A fresh U.N. Security Council resolution could serve as Exhibit A in the Palestinians’ case against settlements at the International Criminal Court. Again, none of these measures alone would resolve the issue. But they would represent the United States playing a more active and genuine role as facilitator in addressing the radical power disparities between the two negotiating parties, and the recognition that, as in any negotiation, incentives to change course must be coupled with disincentives for not doing so. Carrots alone don’t work. You need some sticks. And up until now, it’s basically been all carrots for Israel. “I know what America is,” Netanyahu said in the 2001 video. “America is a thing you can move very easily.” This is what he’s still banking on, because up until this point, he has been correct. Let’s hope he’s wrong now.